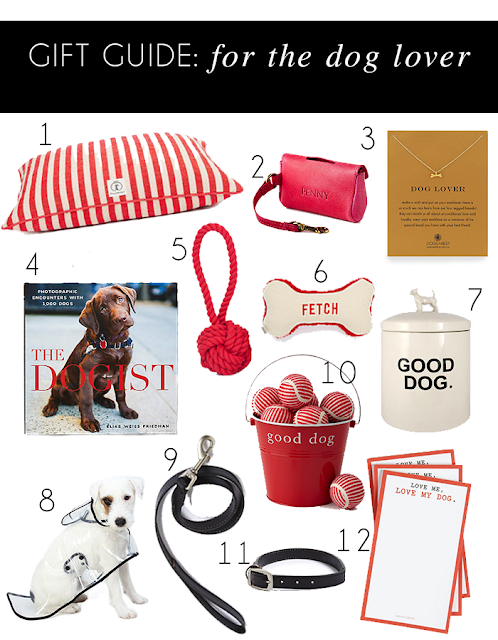 The more I worked on this post, the more I realized that this gift guide should probably be titled "for the dogs and their humans." I have four furry friends on my shopping list this year, and if I'm being totally honest they will be the most spoiled on Christmas morning. I'm also the woman who had a 30 minute conversation in HomeGoods with a fellow dog lover about what toys last the longest, but at least I'm a dedicated dog mom, right? Speaking of HomeGoods, it's a real treasure trove for anything and everything you could want for your pooch. Pecan's dog bed, accessories, and most of his toys came from our local store! Pecan has had the same leash and collar for almost the entire time we've had him, so this year I think I might upgrade him to this and this. It's also been super rainy lately, and Pecan is not a huge fan of his fur being wet, so this little rain jacket would be perfect for keeping him dry! This bucket of balls is perfect for the dog that loves to play fetch, and this rope is one of Pecan's favorites to play tug of war with. Some more of his favorites are Martha Stewart plush toys from Petsmart (surprisingly well made) and anything from the brand ChewTuff that you can find in store at Target. I'll also link some others at the bottom of the post! I know I titled this post "for the dog lover", so I think I should spend some time talking about the things that are actually for humans on this guide. I love this necklace because it's simple and delicate and can easily be mixed with other jewelry. This book would be great on the coffee table of the person on your list who loves their dog but also loves home decor. I also found these super cute coasters that would look fabulous on any dog lover's bar cart! If you have any questions about anything and everything dog related or just need some recommendations for toys, feel free to ask! I'm definitely not a dog expert, but I've learned quite a bit in the time that we've had Pecan.